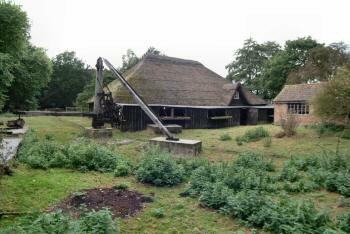 Gunton sawmill was built in the 1820s and in 2008, is unique amongst surviving mills in Norfolk. 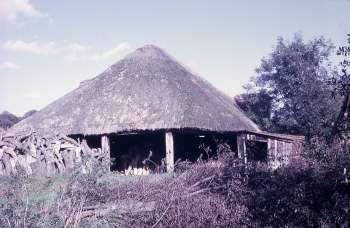 Its construction was simple and consisting of a timber framework that was open on three sides, with a hipped thatched roof of Norfolk Reed. The mill was built to take its water power from Sawmill Lake. The lake surface being set well above the mill provided a 16 foot head of water that powered two identical 12 foot diameter by 5 feet wide breastshot wheels via a guillotine gate. 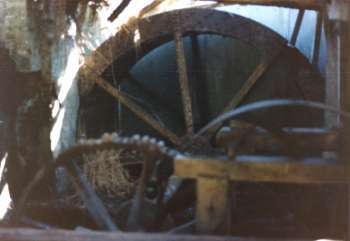 The left hand wheel powered the main 6' 6" flywheel driven reciprocating frame saw and the right hand wheel was set to drive a circular saw and ancilliary equipment including a small corn mill. The mill is was originally built as a sawmill to provide sawn timber for the 12,000 acre Gunton Hall Estate, although it also has a small grist mill set on the beams within the roof area. A small brick outhouse stands beside the mill, this was used as a smithy, a rest area and a workshop. Amongst other things it contained a saw setting vice and in 2007 was housing the diesel engine that ran the lighting generator. Foundations for a steam engine were found in 1976. While the mill was being built Lord Suffield instructed that an armed guard remained on site to discourage workers from destroying the building due to their fear of being put out of work. 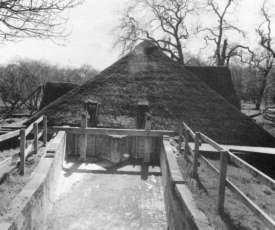 Gunton had a mill listed at the time of Domesday that would have been a corn watermill. Sawmill Lake is linked to the larger lake known as Great Water, which is in turn fed by Hagon Beck. The mill tailrace joins Suffield Beck, which becomes the Blackwater before joining the River Bure. Both the lakes are artificial and were probably created shortly after the hall was built in 1742. The Great Water was created simply by damming Hagon Beck. 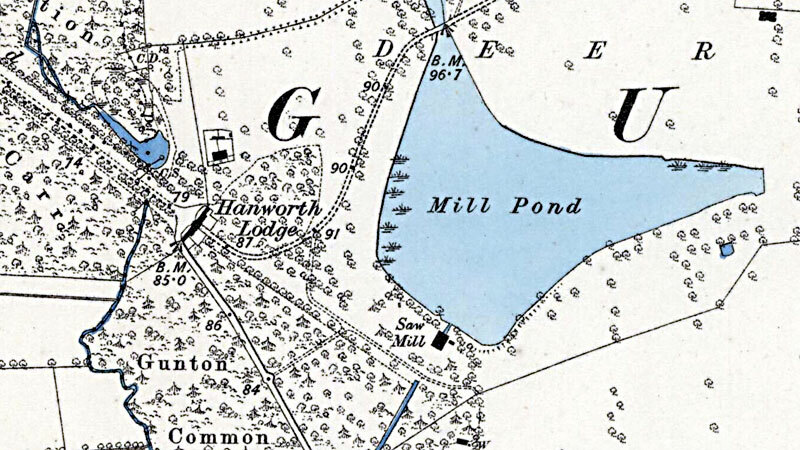 Saw Mill Lake was once known as Old Farm House Pond and before that Park Gate Water. Its position was chosen purely to enhance the view from Gunton Hall and meant that considerable earthworks were required to retain the water. 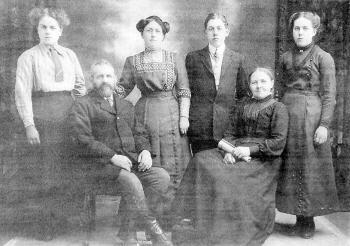 Left to right standing: Maude Elizabeth Ward, Maria (Mary) Ward, Charles Henry Ward, Alice Mary Ward. Charles Henry Ward joined the London & Scottish Regiment and was killed in northern France on 29th October 1916. During the second world war the firm of Longhurst (based in Epsom) was contracted to process timber for the war effort. The main products produced were pit props as these could no longer be imported from Scandinavia and Russia. The lake could not support full time working of the sawmill, which was only built to supply the estate. After two days of continual working the level of the lake would have dropped dramatically. 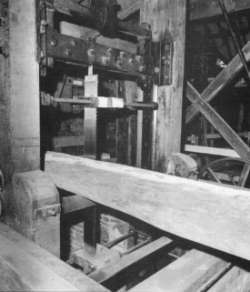 As a result Longhurst installed a bandsaw and circular saw outside the mill run by a steam engine. 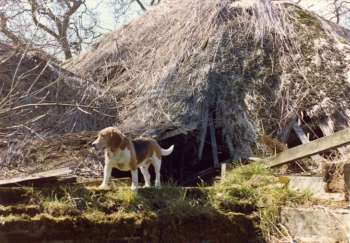 One night during the war years there was a fire that damaged the thatch and some of the roof timbers. There has been some speculation as to the cause of the fire; either an RAF driver was refuelling his vehicle with a lighted cigarette in his mouth or a spark from the ignition system ignited the fuel in a parked timber lorry. During the early 1960s an old tunnel under the lake managed to unblock itself with the result that the whole lake started to empty. A whirlpool appeared about 30 yards out as water poured out flooding a large area below the lake including the interior of the mill. It was three days before anything was done, eventually 14 sacks were filled with sawdust from the mill and taken out into the lake by rowing boat. This was followed by buckets of earth until the hole was finally blocked once more by the Monday evening. The mill leat is the artificial channel that feeds water from the water source to the waterwheel. The leat at Gunton is made of rendered brickwork. 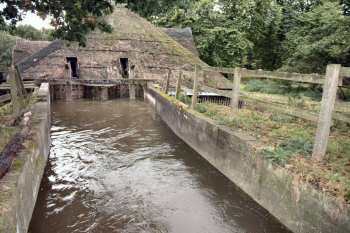 The leat inlet is controlled by a sluice and wheel shuts are smaller sluices that allow water to be fed to the wheels. By the early 1970s the centre oak upright posts had sunk into the floor leaving a good 6" gap at the top. 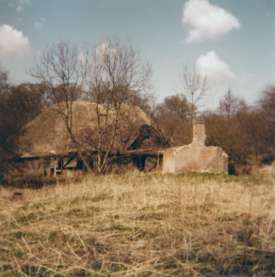 The mill ceased working in the 1950s and over the years became derelict. 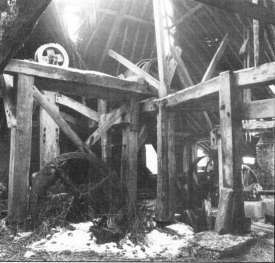 In 1976 it was decided to demolish the mill and the grist mill machinery was offered to the Norfolk Museum Service, thereby alerting the Norfolk Industrial Archaeology Society (NIAS). 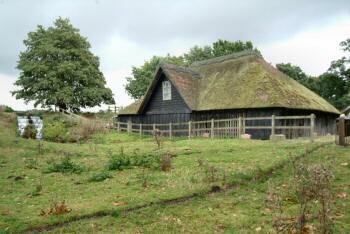 In 1979 The Norfolk Windmills Trust purchased the lease and in partnership with NIAS, proceeded to restore the mill. (See links page) The fully restored building is now open to the public on several occasions throughout the year and the dates are well publicised in the local press. 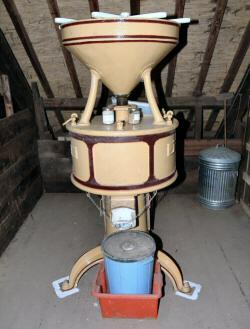 The small flour mill was made by Ransomes & Sims of Ipswich in 1868 and cost £60. The cast iron casing contained two 2' 6" French burr stones. The upper stone was in fact the bedstone, leaving the lower stone as the runner, which was adjustable to accommodate either grinding for flour or crushing for animal feed. 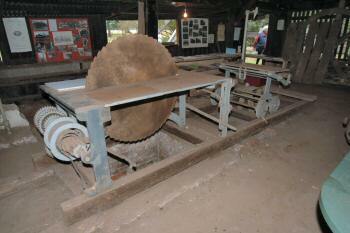 It was said to have been used to grind flour for the Hon. Doris Harbord for many years and was last used in 1952. Holmes & Son of Norwich replaced the original much repaired wooden waterwheels with two iron waterwheels in 1888 at a cost of £164. The wheels were never connected together and always worked different machinery. 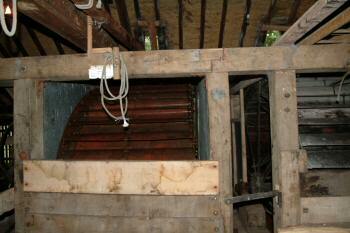 The right hand (eastern) wheel drove the circular saw and the grist mill; it was restored by NIAS. 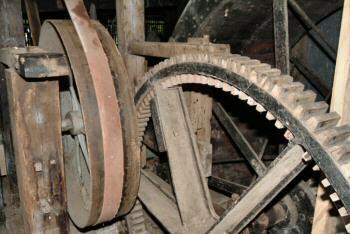 The left hand (western) wheel drove the frame saw and was restored by millwright John Lawn for the Norfolk Windmills Trust. Both wheels are faithful copies of their predecessors. 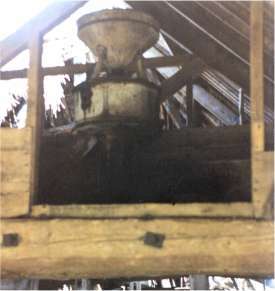 The mill contained two types of saw, a frame saw and a circular saw. The frame saw moved up and down in a similar fashion to a two man pit saw and was capable of planking trees 2½ feet wide and up to 20 feet long. 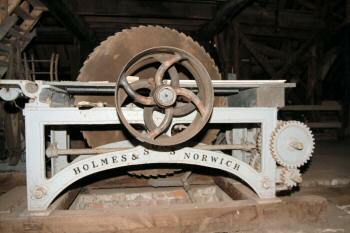 The Holmes (of Norwich) circular saw was also a ripsaw and worked in conjunction with the frame saw, cutting smaller timbers, whilst all cross cutting was done by hand. The Holmes saw was thrown out during the second world wart to make way for vehicle parking. Some 70% of it survived intact and the remainder has since been made up. A smaller circular saw was acquired, probably around 1950, this was used for miscellaneous work and was belt driven from a farm tractor. The up-and-down saw is a unique survivor, the only working example in the UK - there are only a few left in the world. It has more ironwork in its construction than usual, because Hase ran an iron foundry and was a self taught engineer. It was an estate tool, so free of commercial pressures. The estate was proudly self sufficient. A skill born of experience was needed to work it and was passed from one sawyer to the next for around 90 years. We suspect that the First War broke that pattern and after it the incentive to relearn was absent. The machinery was rickety, contractors were available and it was scarcely used. Memories from old men who played around the mill as kids gave contradictory accounts. Probably occasionally the sawyers tried; perhaps they were put off by the absence of any fence to guide the log. It is remarkable that so much survived but there was sufficient for the wood to be measured and replaced like-for-like and the iron to be cleaned and repainted. 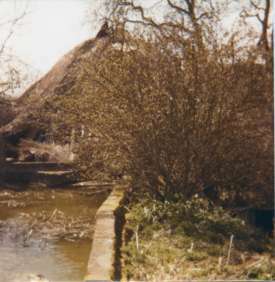 The original corn_watermill was situated below the Great Water (Park Gate Water not having been constructed then). 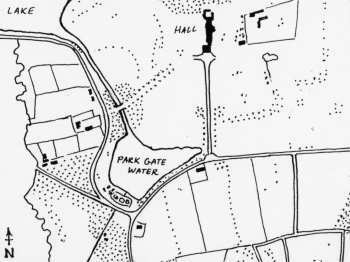 The outlet from Great Water would have crossed the road as it approached the Gatehouse and the mill stood close to the road at that point. However, the mill would have become ruined when Lord Suffield built his ornamental lake and starved the old mill of a water supply. Gunton Park Sawmill has been open to the public for demonstration working on the fourth Sunday afternoon of each month between April and September since 1988, manned by a team of skilled volunteers. 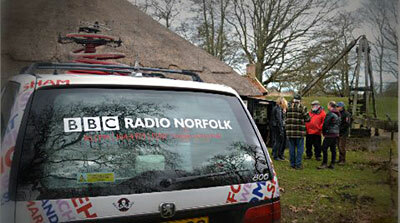 Norfolk Windmills Trust and NIAS would be pleased to welcome any additional help. NIAS articles specifically relating to the mill are always available for sale on opening days along with other complimentary literature. 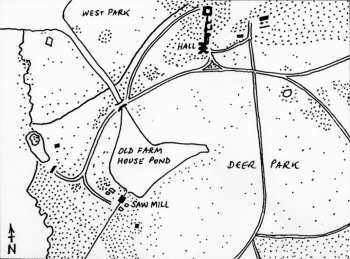 I was born in Suffield 46 years ago and I grew up spending many hours with my friends playing "on the Park". My grandfather Robert (Bob) Amies was for many years bailiff at the "pond" as it was known. I would sometimes accompany him on his rounds to collect money from those fishing there. 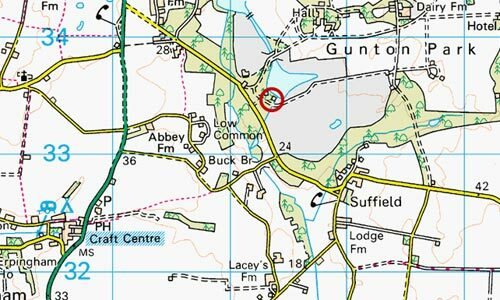 I am inextricably connected to Suffield and Gunton; there has been an Amies presence in Suffield for at least 200 years. My gr-gr-gr uncle is recorded as living in Suffield and later in Gunton as a Blacksmith. Maybe he did work at the mill itself, and my great-grandmother was in service at the Hall (1901). I was especially surprised to see the photographs of one John Ward on the site. 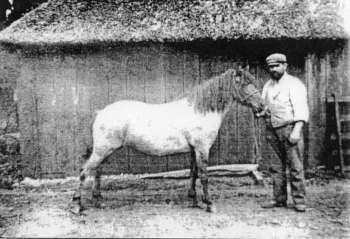 My gr-gr-gr grandmother was a Ward, born in Thorpe Market and she had a brother John, born c.1832, who was likely to have been the uncle of the John Ward born c.1857 and shown in the photograph. His father is also described as being a 'Woodman' in 1851. It's uncanny really how you can be somewhere and have a sense of 'belonging' and the more research I do the smaller the world seems to become. I hope to be able to visit the mill soon and to be able to see it in full working order and not just imagine it so as I did when a child. 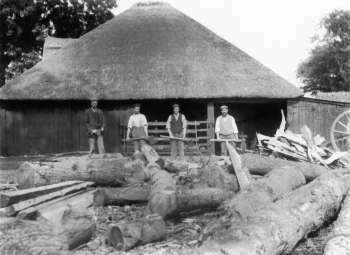 An historic sawmill that is one of the hidden treasures of north Norfolk will be given another 30 years of life - thanks to a lottery windfall. Gunton Sawmill was thought to be two years from closing to the public because its bedraggled thatch is allowing water to drip on the machinery, which dates from the 19th century. 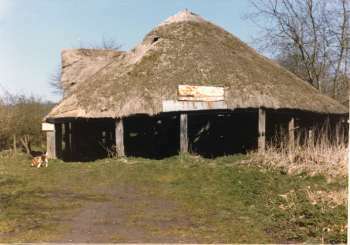 But a chance meeting at the Norfolk Record Office led to a successful bid for £69,000 from the National Lottery, which will repair the thatch and enable volunteers to make the facility more visitor friendly. Volunteer Russell Yeomans said: “There was an exhibition about Gunton at the Norfolk Record Office and David Doak and I went along. “We were talking to the organiser and he pointed us in the direction of a chap who was an east of England lottery fund manager. He added: “We were absolutely delighted to hear that we had been successful. Of the £69,000, £45,000 will be used to thatch the roof. We will repaint the outside and re-render the mill race where the water comes in. Mr Yeomans said the volunteers - who opened the sawmill to the public occasionally throughout the year - wanted to “make it more accessible and open it up to specialist groups”. The mill was built in the 1820s and is unique amongst surviving mills in Norfolk. It was built to take its water power from Sawmill Lake, and was designed to provide sawn timber for the 12,000-acre Gunton Hall estate, although it also has a small grist mill set on the beams within the roof area. A small brick outhouse stands beside the mill, which was used as a smithy, a rest area and a workshop. I have been keeping old news cuttings about the mill mainly because my wife got herself involved in this craze of chasing up her family tree and she made me do a little searching of my own. Your portrait of the head sawyer John Henry Ward and his family in the North Norfolk news May 2 2013 is my Grandfather. My name is John Anthony Ward and I have two sons James & Timothy. I slightly remember that John Henry lived in Thorpe Hamlet. 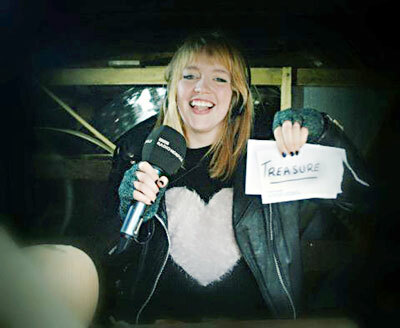 Radio Norfolk's Sunday morning Treasure Quest ended at the mill on Sunday 1st March 2015, where clue solver Sophie Little found the treaure under a plane on the carpenter's bench with nine minutes to spare. The 2013 open days were 23rd June, 28th July, 25th August and 22nd September although the July opening was dependant on the rethatching of the mill having been completed. 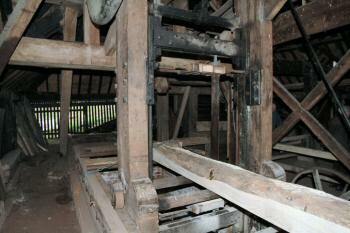 July 2013: Mill to be rethatched and revitalised using a £69,000 grant from the National Lottery.